Bacon is baked in the oven in a bourbon and brown sugar glaze. Preheat oven to 350 degrees F. Line a large rimmed baking sheet with parchment paper. Lay the slices of bacon down on the baking sheet, as many as will fit. Using a pastry brush, brush the bourbon evenly over the slices of bacon. Sprinkle the brown sugar evenly over the bacon. 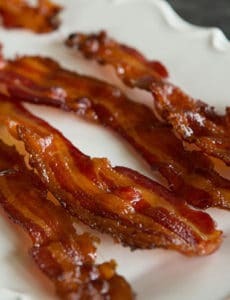 Bake for 25 to 30 minutes, or until the bacon is dark brown and crispy. Using tongs, remove to a paper towel-lined plate and allow to cool for 10 minutes before serving.